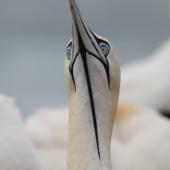 Gannets are large, predominantly white seabirds with pale orange-yellow heads, black flight feathers and a distinctive, elongate body shape that looks pointed at both ends. Their flight is also characteristic, with deep wristy flapping flight. 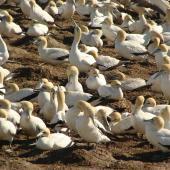 The Cape gannet is an extremely rare vagrant to New Zealand waters, and is probably only reliably identified if it is seen closely on land, either as a bird visiting one of the breeding colonies of the similar-looking Australasian gannet, Morus serrator, or as a fresh corpse washed up on a beach. The Cape gannet is a large white-bodied seabird with black primary and secondary wing feathers, pale orange-yellow head, and a black tail. In general appearance, other than the tail pattern, it is similar to but slightly larger than the familiar Australasian gannet. The tail of the Cape gannet is wholly black, in contrast to the black central and white outer tail feathers of the Australasian gannet. Overall, the species is probably not reliably distinguished at sea from Australasian gannets. 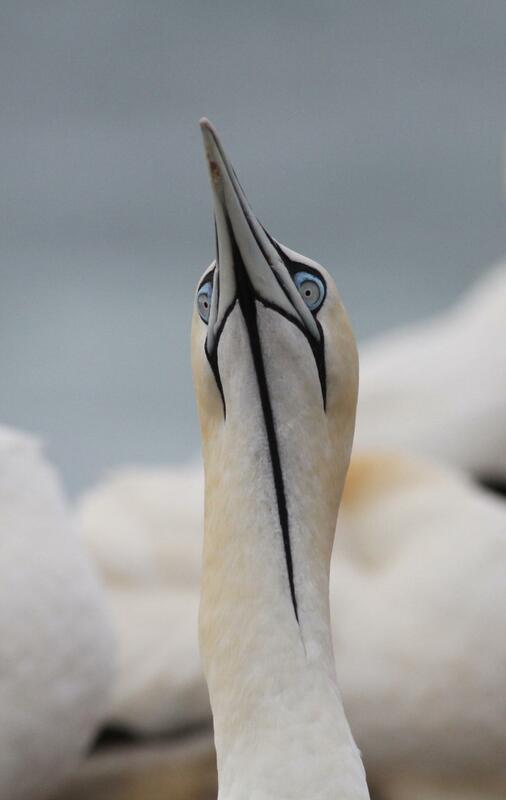 Seen close up, the Cape gannet has a distinctly longer black, featherless gular stripe, stretching from the base of the lower mandible down to the middle of the throat (confined to the base of the chin in the Australasian gannet); a pale orange-yellow head (more golden in the Australasian gannet); a white rather than pale grey iris; and brighter, cyan stripes down the foreleg and toes (electric blue in the Australasian gannet). 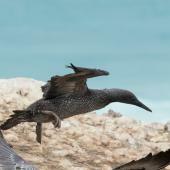 Juvenile Cape gannets are much darker brown than the light brown, speckled juvenile Australasian gannets. 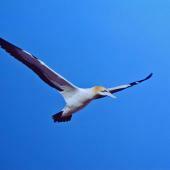 Although immature birds are similar, Cape gannets are more uniformly dark brown above. 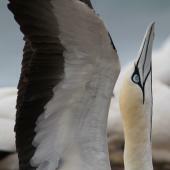 Calls: similar to but deeper than Australasian gannet (about two-thirds of an octave lower in the Cape gannet). Similar species: apart from the Australasian gannet, the only other species with which it might be confused is the masked booby, a smaller, similarly coloured species that has a white, not yellow-orange head, and a yellow, not bluish-grey bill. The other predominantly black-and-white seabirds are the much larger royal and wandering albatrosses, which have quite different wing shapes and flight. 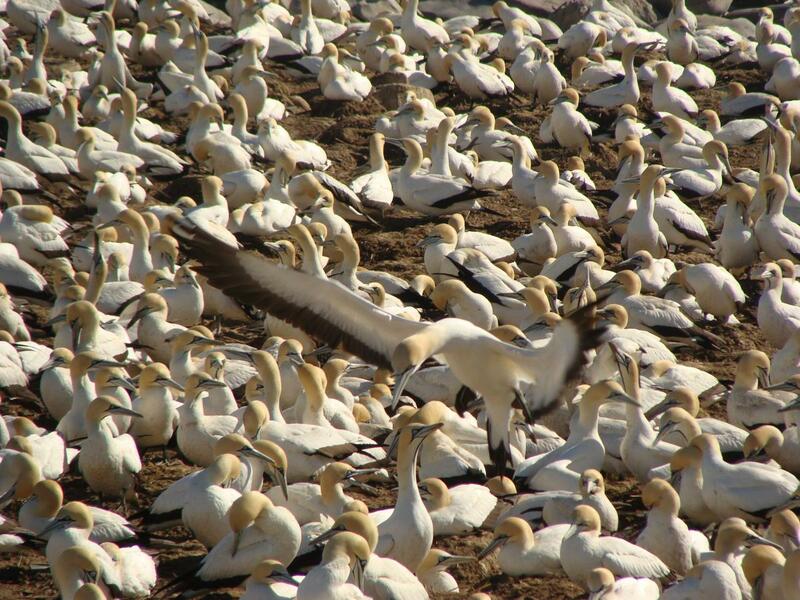 Cape gannets breed on arid offshore islands along the South African and Namibian coasts, foraging in adjacent seas. Outside the breeding season, birds range widely in offshore waters, often following large shoals of sardines on their annual migration north along the eastern coast of South Africa. Some birds range more widely into oceanic waters, occasionally as far afield as South America, the southern Indian ocean, and Australia. 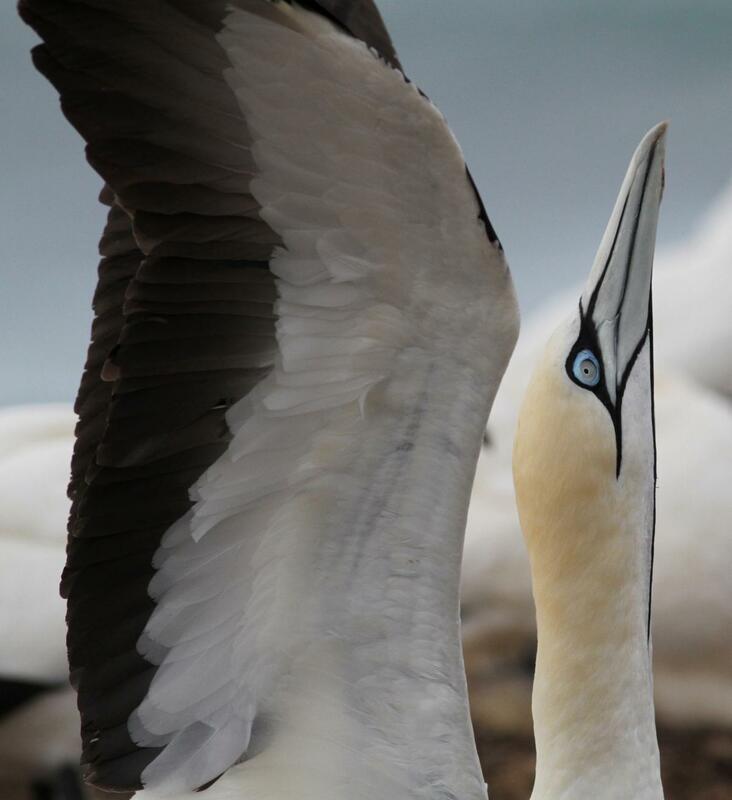 The first New Zealand record of Cape gannet was an adult male observed at the Australasian gannet colony at Cape Kidnappers for five successive breeding seasons between 1997 and 2002, then again briefly at the start of the 2005 breeding season. During much of this time the bird was paired with a female Australasian gannet, hatching 3 chicks, 2 of which fledged successfully. One of these fledged birds, a male, returned to the colony 4 years later, in September 2005, where it was later seen incubating an egg. The second record was a bird among the gannet colony at the tip of Farewell Spit in December 2015. Vagrant birds have also been recorded from Australia on several occasions, with a pair fledging a chick at Point Danger, Portland, in February 2017. 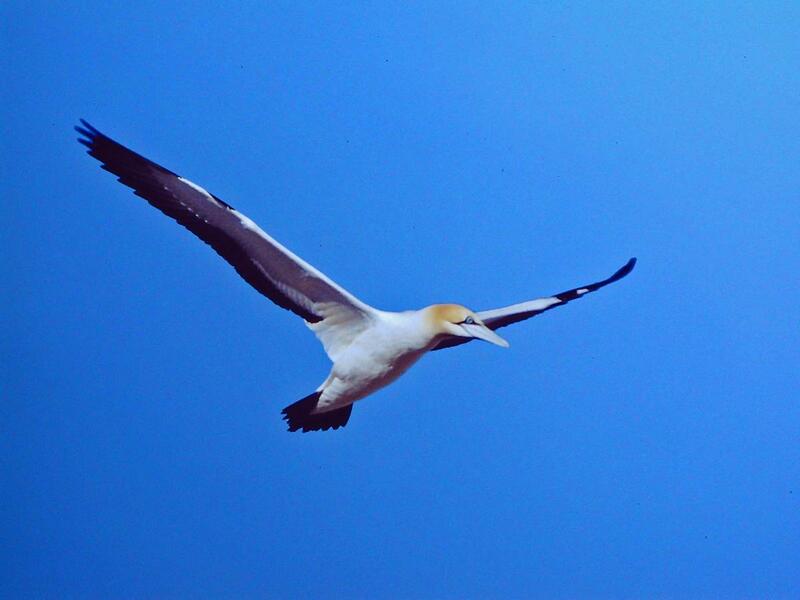 A typical gannet, flying 20-30 m above the sea, periodically plunging down below the surface to pursue fish. Just before entering the water, the wings are swept back against the body, giving the birds the most streamlined shape possible for the dive, so that they look like javelins when hitting the water. 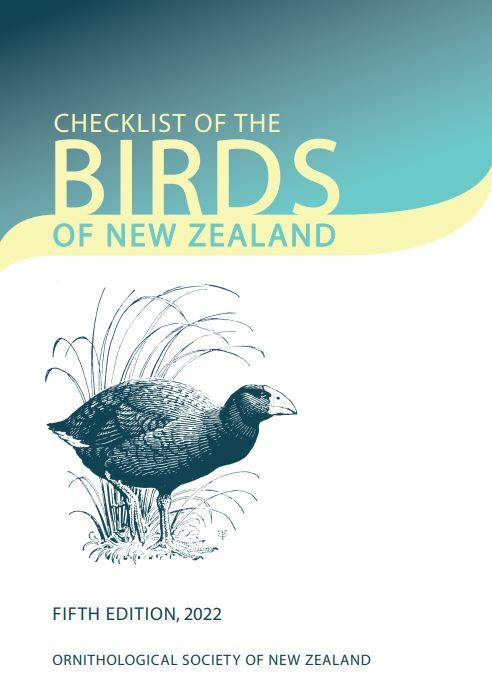 As a result, the birds lose little or no speed initially on entering the water. Inflatable air sacs and a reinforced skull cushion the shock of impact. Similar to Australasian gannet, but no New Zealand data available. In South Africa, they feed predominantly on pilchard, Sardinops ocellatus, anchovy, Engraulis capensis (=Engraulis encrasicolus), saury, Scomberesox saurus, and sardine, Sardinops sagax. Adams, N.J.; Klages, N.T.W. 1999. 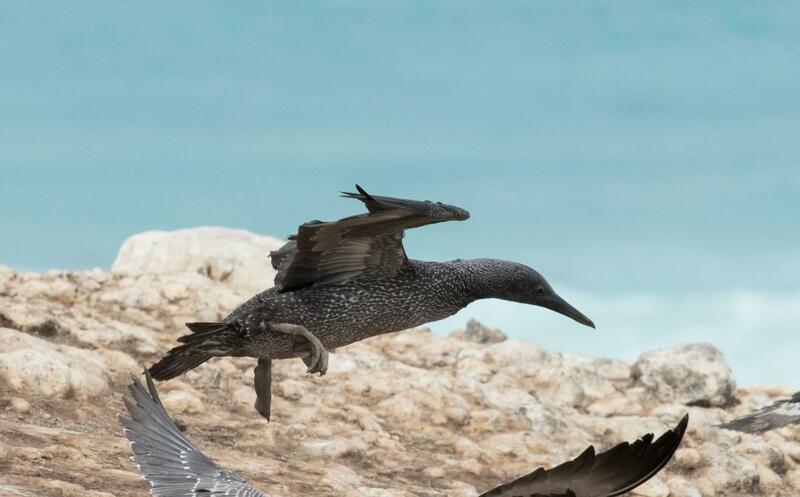 Foraging effort and prey choice in Cape gannets. South African Journal of Marine Science 12: 157-163. Klages, N.T.W. ; Willis, A.B. ; Ross, G.J.B. 1992. 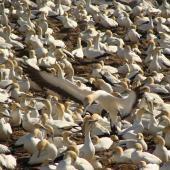 Variability in the diet of the Cape gannet at Bird Island, Algoa Bay, South Africa. South African Journal of Marine Science 12: 761-771. Robertson, C.J.R. ; Stephenson, B.M. 2005. 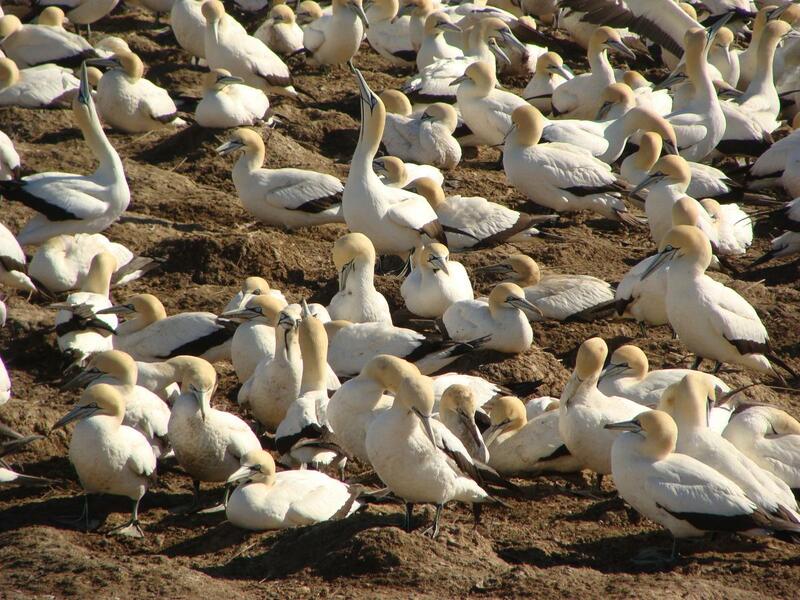 Cape gannet (Sula capensis) breeding at Cape Kidnappers, New Zealand. Notornis 52: 238-242. Ropert-Coudert, Y.; Grémillet, D.; Ryan, P.; Kato, A.; Naito, Y.; Le Maho, Y. 2004. Between air and water: the plunge dive of the Cape gannet Morus capensis. Ibis 146: 281-290. A large white-bodied seabird with black primary and secondary wing feathers, pale orange-yellow head, and a wholly black tail. In general appearance, other than the tail pattern, it is similar to but slightly larger than the Australasian gannet.